He appeared in only 5 movies, all of which were nominated by the Academy for Best Picture, and worked with some of the ‘‘70s biggest stars. Today, most people know him as Fredo, the weak, somewhat sad brother of Michael Corleone in the first two Godfather films, but very few can recall his real name. 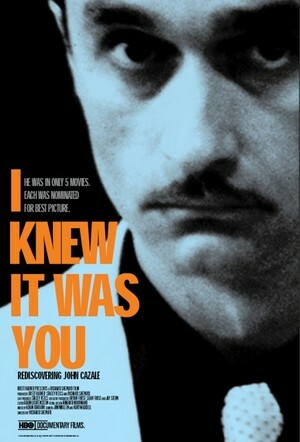 Released in 2009, the documentary short I Knew It Was You: Rediscovering John Cazale is a loving tribute to an actor who, even over 30 years after his untimely death, deserves to be remembered. Born in Massachusetts in 1935, John Cazale eventually made his way to New York in the hopes of becoming an actor, and it was while appearing in the Israel Horowitz play Line (alongside Richard Dreyfuss) that producer Fred Roos first noticed him. Believing he would be ideal for the part of Fredo in his upcoming movie The Godfather, Roos arranged a meeting between Cazale and Francis Ford Coppola, who was so impressed with the actor that he not only cast him in The Godfather, but also wrote a part especially for him in his 1974 movie The Conversation (in which Cazale plays the assistant of Gene Hackman’s paranoid surveillance expert). A bigger role in The Godfather Part II brought Cazale even more recognition, as did his portrayal of the extremely nervous bank robber Sal in Sidney Lumet’s Dog Day Afternoon. In between his film roles, Cazale returned to the stage, and while appearing in the 1976 play Measure for Measure he met the love of his life, Meryl Streep, who would stand by his side when, a few months later, he was diagnosed with lung cancer. Rejected at first for the role of Stanley in Michael Cimino’s The Deer Hunter (due to his illness, no company was willing to insure him), Robert DeNiro pleaded for Cazale to be cast, and despite the fact he was sick at the time, the actor delivered yet another bravura performance. John Cazale died in March of 1978, shortly before The Deer Hunter was released to theaters. Initially broadcast on cable station HBO and borrowing its title from a famous scene in The Godfather Part II, I Knew It Was You features interviews with those actors (Al Pacino, Robert DeNiro, Gene Hackman) and directors (Sidney Lumet, Francis Ford Coppola, playwright Israel Horowitz) who worked with Cazale; as we hear from Hollywood's next generation (Steve Buscemi, Philip Seymour Hoffman, Sam Rockwell, Brett Ra5tner) who were inspired by the late thespian’s performances. Those who knew him spoke of his meticulous nature, how he was never content with simply knowing his character’s motivations (instead, he’d search for their weaknesses, those things they feared the most, which always brought a vulnerability to the characters he played). I Knew It Was You also looks at Cazale's personal life, featuring old pictures and brief chats with friends who knew him, as well as a more in-depth interview with Meryl Streep, who was at the actor’s side the day he passed (both Pacino and Cazale’s brother Steve speak highly of Streep’s dedication to John, as well as her strength in what was certainly a difficult time). In the end, I Knew It Was You accomplished exactly what it set out to do: “rediscover” John Cazale, reminding modern film buffs what it was that made him so special. Towards the conclusion of the documentary, an old friend of Cazale’s talks of how it’s been 30 years since the actor died, and wonders what other fine performances he might have given had he survived. Film critic David Thomson wrote of Cazale: "it is the lives and work of people like John Cazale that make filmgoing worthwhile. In heaven, I hope, there will be no stars, just supporting actors . . . So watch Cazale in The Godfather Part II addicted to daiquiris and the women he can't keep in order - he is the only hope in that terrible family."